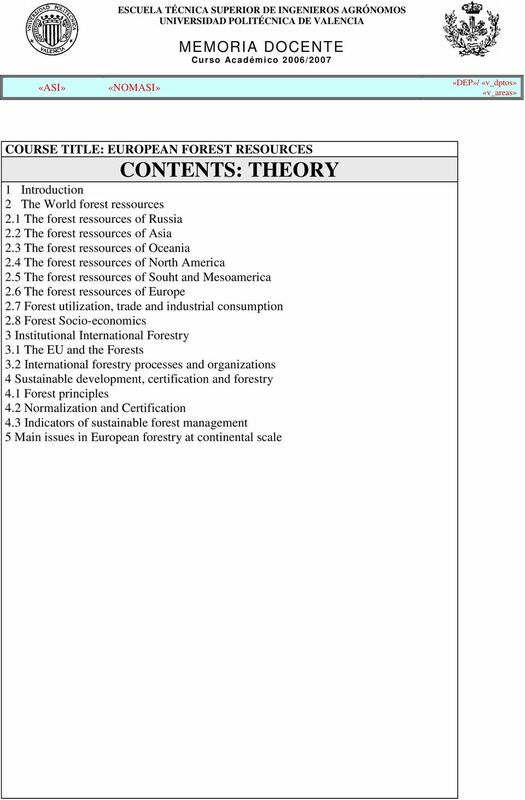 Download "FICHA MEMORIA DOCENTE Curso Académico 2006/ 07"
2 COURSE TITLE: EUROPEAN FOREST RESOURCES OBJECTIVES The main objective of this subject is to provide the forest students the suficient skills and knowledge that allow them the understanding of the spatial and tempral divesity of forest ressources over the European continent as well as the conditioning factors. Between them, accelerated social changes are a key element of temporal dynamic introduced in the course. Using English as teaching language shall not only familiarize the students in the new lingua franca, but also promote the contact with other students taking this subject in other European universities, as well as the use of internet as information source. EVALUATION The evaluation will consider the active participation in the classes and seminars, especially the presentation of each student of a country report. 1. ASIGNATURA / COURSE TITLE Economía, Organización y Dirección de la Innovación Tecnológica / Economics, Organization and Management of Technological Innovation 1.1. Código / Course number 31277 1.2. 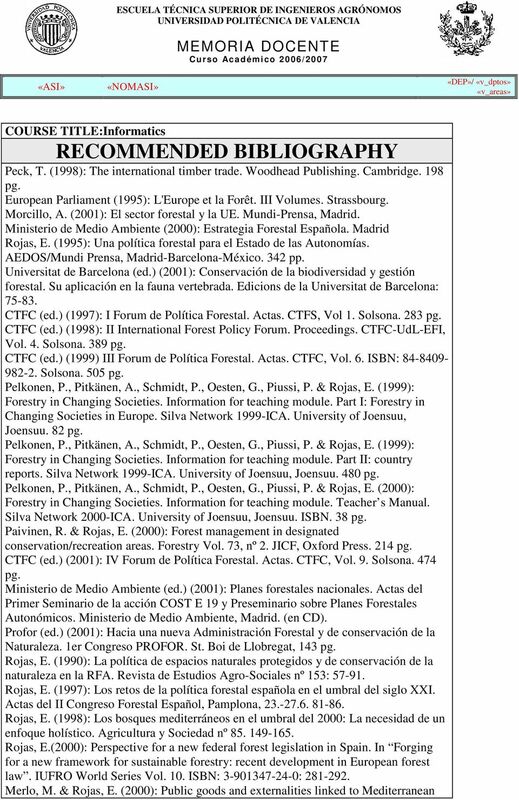 ASIGNATURA / COURSE TITLE GEOQUÍMICA AMBIENTAL APLICADA/ APPLIED ENVIRONMENTAL GEOCHEMISTRY 1.1. Código / Course number 32960 1.2. Materia / Content area Módulo optativo. 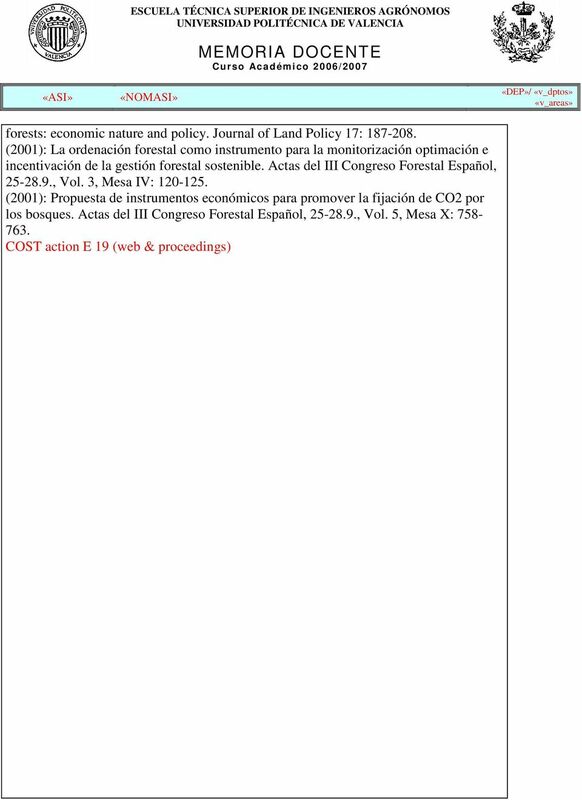 Especialización Ambiental 1.3. 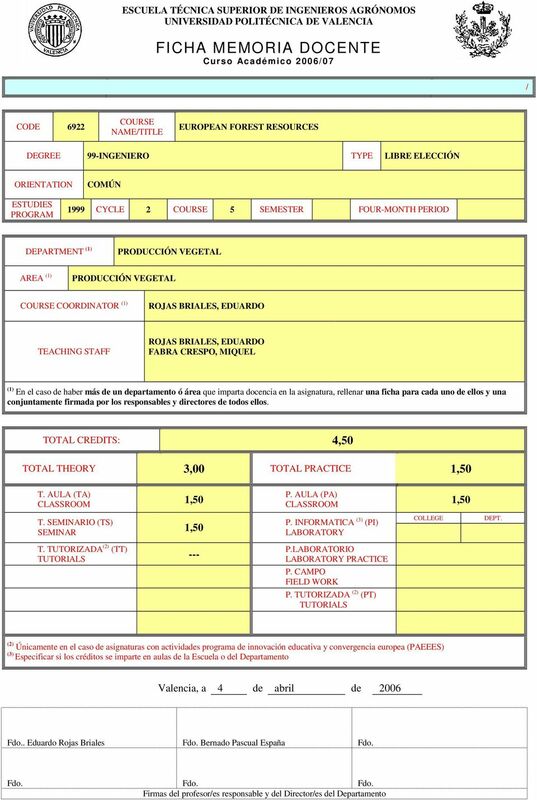 Universidad Autónoma de Madrid UNIVERSIDAD AUTÓNOMA DE MADRID GUÍA DOCENTE Asignatura: TÉCNICAS DE AGRUPACIÓN Tipo: Optativa Nivel: Posgrado Centro: Facultad de Psicología Curso académico: 2015/2016 1. For this course students should have a basic knowledge of economic theory and structure. 1. ASIGNATURA / COURSE 1.1.1. Nombre / Course Title Técnicas de comunicación y de los mensajes / Techniques of marketing communication and advetising message 1.2. Código / Course Code 13536 / 13536 1.3. La enseñanza del inglés como Le/L2: tendencias metodológicas y aplicaciones prácticas en el aula de Secundaria.